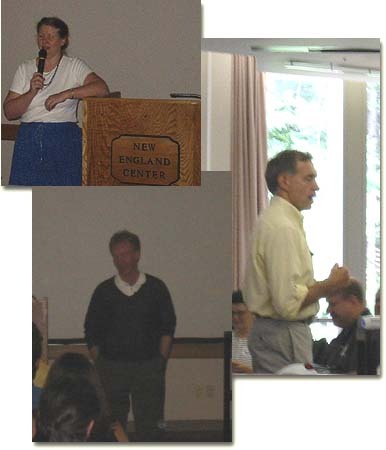 Here are the presentations and documents from the CLE conference in June of 2002. If you missed the most recent conference and you want to make sure that you do not miss the next one please registerwith the Creative Learning Exchange. The program for the System Thinking and Dynamic Modeling Conference hosted by the Creative Learning Exchange in June, 2002. PETER SENGE (bottom left): "The Hidden Business-Education Link: how long will we be victims of the prevailing system of management?" 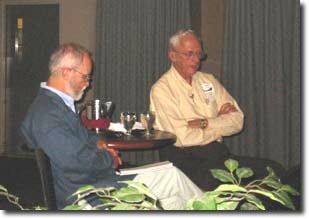 BARRY RICHMOND (right): "Working Toward a Unifying Vision"
Listed below are the 47 sessions from the 2002 CLE conference and any affiliated handouts and presentations. Learners of every age can benefit from using visual tools to map their thinking. This session will introduce the concepts and mechanics of an array of systems thinking tools and will demonstrate how K-12 educators and students have used the tools to increase student learning. Participants will have opportunities to use some of the tools in an experimental practice field. This session will introduce novices to dynamic modeling software most commonly used in K-12 education, STELLA. Participants will build simple models that demonstrate linear and exponential growth. They will expand the exponential growth model into a population model, the core model used in many k-12 models, and finally into S-shaped growth. If time allows, participants will also be given an opportunity to explore several models in common use. Please bring a laptop computer for this session. Email us if this is impossible, and we will try to supply one. While revising the book, Beyond the Limits, to include new data through the year 2000, Dennis Meadows created a CD version of the World3 model. It includes the World3 equations, a STELLA runtime package, and a user's manual. This wonderful new resource offers students a convenient and inexpensive way to reproduce all the scenarios in the classic book and to carry out experiments with new policies and different assumptions. Dennis will briefly describe the goals, structure, and results of World3 and demonstrate the CD version of the model. He will offer suggestions for assignments that can be given to students to facilitate their understanding of the model, and he will list a few caveats to observe when assigning students complex models. The NSF National Computational Science Leadership Program has developed a cadre of trained science and mathematics teachers to promote a variety of visualization tools within the context of effective lessons. Software tools available to schools were used to visualize models of systems, and coordinated lesson plans were developed for specific disciplines. This session will include an overview of the program, resources, and demonstrations of systems modeling using Inspiration, Model-It, Microsoft-Excel, JAVA applets, and STELLA. The development of thoughtful models for technology integration in schools will be an ongoing theme during this presentation. Teachers from the Harvard Public Schools, Harvard MA, will display a seventh grade unit which uses behavior-over-time graphs, causal loops, archetypes, a STELLA model, and a simulation game to explore some of the dynamics of the cold war era through Science, Literature, Math and Social Studies. For the last three years, work has been going on to introduce ST/SD to elementary students in Glynn County through the GIST project with a Waters Foundation grant. First, a classroom atmosphere of a learning community is established through the use of Systems Thinking concepts. Then, the fundamental tools and concepts of System Dynamics are taught. After the fundamentals are taught, students and teachers practice their use with a variety of activities. With this method, ST/SD becomes a natural part of the teachers' and students' teaching and learning styles. Both the students and teachers then incorporate the tools and concepts in a variety of ways in many learning activities. This workshop/presentation will share basic introductory activities used and discuss the concepts behind this method of introducing ST/SD to students. Use simple pencil and paper activities and a bank balance problem to teach students the basics of system dynamics: What does the computer do with your equations? How do stocks and flows work? What is dt? Also learn how to use pencil simulation to debug models. Examples of system dynamics lessons will be explored. These lessons fall into one of four categories: Introductory SD lessons that reinforce simple core content; Second level lessons to study more sophisticated behavioral interactions over time; and two additional levels that require students to create original models. Students from Brookfield have worked to develop a presentation for the school principal to use in his case to the school district to make changes in the traffic flow to reduce the risk of an accident between a car and a student. The students collected traffic and student flow data, brainstormed to decide what factors to include, learned about and incorporated risk analysis in the recommendations and put together a presentation that could be used by the principal to convince the School Council and School District to make changes recommended in the report to reduce the risk of student injury. Learn how to draw causal connections among elements in a story or situation. Practice the next step of building a causal loop diagram. Participate in a conversation about how to enrich student learning and understanding using connection circles, a tool, which helps develop skills necessary for reading and creating causal loop diagrams. The presenters will share results of their action research regarding how the use of systems tools and structures impacted student learning. Participants will see examples of systems tools used in a variety of high school Social Studies courses, specifically: a computer simulation on F.D.R.-U.S. History ; uses of the iceberg as a way to analyze current issues-Economics and the Political Process; causal loops used to investigate connections and circular causality to understand how certain actions and structures could address problems faced by a developing nation-Global Studies. Participants will first have an introduction to each of the three classes and then have the opportunity for deeper experiential learning in the area of their interest. Steve and Sheryl will share their experience using behavior-over-time graphs, stock/flow diagrams, causal loop diagrams, and Stella models to teach systems concepts of change over time, accumulation, thresholds, and balancing and reinforcing feedback. The presentation will include an overview of the year, then participants will role-play the students in a demonstration of one of the activities. This session will look at ST/DM courses and ST/DM enhanced courses and their relationship to schools and community. The presenters will focus on the experiences in Door County, WI and the Northwest Lasallian efforts in the larger San Francisco District. What are the lessons learned and what are future actions to bring schools, communities and classes forward with a common focus? Have you ever wished there was a SimSchool? The MinSIM (Minnesota System Information Modeling) is the first major project to apply System Dynamics to school district data-driven decision-making. MinSIM is designed to: help administrators better understand how their systems operate, allow users to explore the allocation of resources and other planning scenarios, and to build accountability tools that allow schools to assess their performance against their resources and population. This presentation will describe the process used to create the MinSIM simulator and explain the structure of the underlying model, which contains over two dozen sub models. A highlight of the presentation will allow participants to "run" a school district, making decisions about budgeting, staff, facilities, and students. This session will focus on a computer simulation that incorporates Dr. Edward J. Gallaher' ( Oregon Health Sciences University) Oral Pharmacokinetic Model. Learn how a high school physics teacher(an authority on modeling) and a middle school Health Science teacher (knowledgeable about medications and diseases)teamed to construct a problem based computer simulation that focuses on drugs as medicine and helps students understand how prescription and over the counter medicines can be used safely. This session will provide an overview of a 30 hour training developed in Portland, Oregon. Topics addressed in the training agenda include: o Creating a context with teacher experience with visual tools o Developing understanding of systems thinking and dynamic modeling o Providing guided practice with classroom and organizational applications o Allowing time for study and adapting of lesson plans. Participants will participate in discussion of the sequence and format of the training sessions. Persons willing to participate in piloting and feedback of the training will receive a CD containing related PowerPoint slides, agenda, activity sheets, and resource materials. In the attempt to make current events meaningful and understandable by middle school students, I used the beginning steps of a system analysis with my class this fall. We brainstormed topics. They ranged from terrorism to trash, from soccer fans to foods. After a successful multi-vote process, two topics of interest were chosen - Afghanistan and faux food. The instructional piece that I brought to the work was the order of analysis: definition of purpose, change over time, interdependence, feedback, and leverage. We approached our two subjects in this order. We defined what we knew and what we wanted to find out. Students found they knew very little of the lengthy history of aggression and turmoil in the Middle East. They were amazed at how much "food" they consumed that had never been grown or raised in the light of day. They formulated questions and timelines. The changes identified brought about more questions. Research into what factors influenced the changes and what feedback loops created balancing or reinforcing situations brought us to the final step (for these groups). As the closing exercise, the students were asked to analyze what they had learned and to make a prediction. This prediction contained the opinions they had, the evidences they gathered, and as a conclusion, what they thought would be the leverage to make lasting change. This workshop explores how some children's stories may be used by educators as part of efforts to integrate systems concepts and tools into K-12 curricula. It is also suitable for parents looking to incorporate systems-based inquiry into every day conversations with children of all ages. In this workshop, we will review the basic story line of several children's stories (including both picture and chapter books), surface targeted systems concepts within each story, and identify practical "debrief" questions for educators and parents. Please come prepared to read out loud and to share your own "systems thinking stories". In this session, I'll share what I've done with systems in teaching an STS/WI class. This class does not expect students to be (or become) modelers, but they learn to interpret modeling diagrams and use models to make policy decisions. The class has been taught for five years now, and the curriculum is now starting to mature. Population, Agriculture, Energy, Urbanization, and Sustainability issues are covered in this class. It's cross disciplinary (social studies, science), a good class in which to introduce people to systems, and a good class to foster the growth of systems use in schools. This work intends to present a semi-quantitative computer modeling tool called WlinkIt Modeling System and discuss its use in K-12 and undergraduate education from a System Dynamics perspective. In Brazil we developed a semi-quantitative computer modeling system - WLinkIt - to be used in classroom activities to explore ideas in science and other subjects. WLinkIt gives to the student the possibility of thinking about problems by constructing and simulating models using a causal diagram representation [Roberts, 1983]. A model in WlinkIt contains boxes (which represent variables) with vertical levels inside that represent qualitative values and links that represent the relationship between variables. When a model is being simulated (running) the system calculates at each time step the new value of the variables and animates the vertical levels according to them. During the simulation, it is also possible to produce colored simultaneous graphical output of variables. This presentation will demonstrate how systems applications, including computer simulations, can be made in the disciplines of studio art, aesthetics and art history. Through the use of three established curriculum pieces, participants will learn how one can address the needs of right and left brainers in a visual arts class. Also presented will be exemplars of students' work from each unit, and reflective responses from students sharing their new knowledge and understandings. It is my goal to demonstrate the effectiveness of systems tools in these disciplines and hopefully inspire additional exploration. Stuck with big questions about the direction of your program/school? Need to get everyone on the same page? Not sure how to structure a meeting to get meaningful results? In this session, examples of using systems thinking tools will be shared to illustrate their utility with committees and faculty/staff. These administrative applications allow for creative, interactive, productive meetings. See how the tools have been used in a large school district and a small independent school. During this past year, an interdisciplinary team of Vermont Commons School teachers has worked to develop students' skills in using systems tools to reconstruct three important transition points in the human past (involving Easter Island, hunter-gatherer civilizations in the past and present, and the role of cod in the European and American experiences during the last five hundred years and beyond) and to hypothesize and simulate alternative pasts ("What if..."). By engaging participants in a "hands-on" tour of the materials and a review of classroom experiences, workshop facilitators seek to illuminate how, where, and why the social sciences are a powerful vehicle for developing students' systemic thinking. A demonstration workshop where a physical device in all of our homes is used to physically demonstrate how balancing feedback leads to goal seeking behavior. As our society transitions beyond an industrial-based system, what must school districts do to move beyond their industrial-based model? We'll share some of the successes and challenges we have found as we have looked at schools, learning, and our roles as educators in fundamentally different ways. Examples include viewing classrooms as "learning cafes" where students build community through meaningful conversations; understanding how "trust" and "mistrust" impact everything we do as educators; and creating a shared vision for the future with staff, students and community members. By learning how schools, businesses and other aspects of our society can flow together towards a more humane, energized and creative future, we hope to attain our district's shared vision to know and lift every child and inspire joy in learning. School reform poses great challenges for school systems. This workshop will present a simulator that school systems can use to understand the dynamics of education reform and, at an aggregate level, examine different strategies for implementing reform. It is based on a System Dynamics model that represents key causal relationships among elements of reform and between reform and a system's ongoing operations. The simulator is not intended as a forecasting tool or "how to" guide, but a framework for helping school systems identify unanticipated and potentially damaging consequences of reform efforts. Participants will be able to suggest different combinations of reforms to examine which ones can work well together and which ones work at cross-purposes to produce undesirable results. Participants will learn how to stage a simulated disease outbreak through the use of student activities and models. They will participate in a shortened version of the Smallpox simulation held in Portland in the spring of 2001. Copies of all models and materials will be provided. Suggestions will also be provided for modifying the activity for other diseases, as well as for varying time length. The session will include a discussion of the insights about building and using models with students gained through the Portland simulation. Purpose of session: Train teachers, administrators on the use of Storytelling features associated with the STELLA® software, as well as the principles associated with telling good stories. Participants will learn Storytelling software mechanics and storytelling principles in the context of building an interactive lecture. Participants then will be able to work on a project of their own choosing, using a model that they have brought along, or one of the more than twenty models that HPS supplies. Using a variety of paper shapes, folds and glue, participants will learn how to make representations of systems commonly taught in K-12 classrooms. Teachers will learn how to help students develop and make 3-dimensional pop-up style books that can enable students to represent their understanding of the dynamics and interdependencies of systems. This approach is supported by multiple intelligence research and activates the right side of the brain in a seemingly left brain-dominant field. This session is appropriate for educators of all ages. A hands-on workshop where participants will experience current elementary school activities that use systems concepts and tools to reach the school district's curricular standards, derived from national standards, in Social Studies, Literature, and Science. Each activity will be presented as it has been used in the classroom, including the teacher language and classroom management strategies used to promote students' learning. These activities are embedded in lessons that have been used in classrooms for two years or longer. This session with a practiced system dynamicist will focus on how to recognize the flaws in a model. Modeling experience either individually or in the classroom is necessary. Some of the topics which may be covered: (1) Model Boundary issues (i.e., conceptualizing the model, deciding what to include and at what level of aggregation), (2) Representation (i.e., how well have the flow equations been formulated? have feedback loops been closed? ), (3) Numeration/testing (is there a good testing regimen? has the model been initialized in steady-state? are the gf's appropriately formulated, and (4) Communicating (how well has the understanding been "made available" for someone else to rediscover?). A new edition of the Systems Thinking Playbook is now available. 260 pages in Vols. I, II, & III tell teachers how to introduce, conduct, and debrief 30 games that convey important insights about paradigms, system structure, and behavior. Co-authors Linda Booth-Sweeney and Dennis Meadows will offer their views on principles for using these exercises in teaching, and they will demonstrate the best of their new games with concrete guidelines for facilitation. There will be time in the workshop for participants to share their own experiences-triumphs and problems- in using Playbook games from Vols I&II. School systems are continually faced with the need to use their limited resources wisely to meet critical needs. System dynamics and computer modeling represent largely untapped tools that could help district leaders determine the most effective use of their resources. This example addresses the need of most school districts to offer professional development opportunities that increase teachers' capacity to use the new curriculum content standards and student-centered instructional techniques. Use of the model allows us to develop answers to the following questions: Can a district build capacity in a critical mass of teachers in a reasonable time period by using workshops to deliver professional development? What are some of the factors that impact this? What are the costs associated with workshops? Environmental issues related to many aspects of sustainability are readily accessible with a systems approach. Students employ BOTG's, CLD's and models to examine the "big" ideas in environmental studies: population and resources, food and land, energy, pollution, and sustainable futures. In this one semester course, high school students study the principles of systems in class and at home, employing MSST lessons (Heinbokel and Potash). Students learn the SD methodology and how it can be employed to understand complex issues and ask better questions. The course is project based and includes a "make-a-difference" component, where students study and propose policies that impact a local or school issue. Dynamic simulation has great potential as a tool for teaching physics and science in general. This presentation will demonstrate a family of simulators designed to teach topics in physics including circular motion, collisions, energy storage, and heat flow. These simulators provide students with laboratories for doing experiments in the context of real-world situations such as driving, home energy conservation, and sports. Examples of experiments that students might do with each of the simulators will be presented and discussed. The simulators were designed to serve as companions to a curriculum called Active Physics (AP) which was created with NSF support to make the subject more appealing and understandable to the majority of high school students who otherwise do not study physics. The focus of this presentation will be on ideas, principles, and guidelines for facilitating systemic change in public school systems. Much of the presentation will revolve around the Guidance System for Transforming Education (GSTE) developed by Jenlink, Reigeluth, Carr-Chellman, and Nelson. The GSTE provides guidelines to a facilitator engaging in a district-wide change process. The guidelines are organized into Discrete and Continuous Events that have been found to be fundamental to any systemic change effort in public school systems. Since November 2000, the presenters have been conducting developmental research on the GSTE in a small urban school district in Indianapolis. The research results, as well as recommendations for improving the GSTE, will be presented. These results have the potential to inform the theory base on how to best work with school districts in a systemic change effort. Recently we were challenged to develop curricular materials to explore system dynamics as a foundation for engaging high school students in interdisciplinary studies. We needed to: engage student interest, be responsive to the schools' need to meet specific learning standards, foster an appreciation for crossing traditional disciplinary boundaries to address "real-world" issues, and provide students and teachers with opportunities to develop system dynamics mind-sets and tool-sets that could transfer to other scenarios. We revised our collegiate course, "Plagues and People," that focused on the impact of epidemic disease on human history. Here we chose to focus consistently on a single disease, smallpox, that has, over millennia, killed more than 100 million individuals. The package consists of 10 case studies; four of the cases have a primary biological focus, four focus on history, and two are interdisciplinary. Each is designed to be free-standing, but to also draw on the insights from other cases and to lead into yet others. Each utilizes a variety of system dynamics-based explorations and provides opportunities for students and teachers with widely differing system dynamics exposure and ability. Collectively, they provide a rich mosaic of intellectual explorations that bridge traditional but limiting barriers separating academic disciplines. In a world of accelerating change, educators, business leaders, environmentalists and scholars are calling for the development of systems thinking. Courses in the K-12 grades, universities, business schools, and corporations seek to teach people to think systemically. But how do people learn to think systemically? What systems concepts are most readily understood? Which tend to be most difficult to grasp? We will present results experiments designed to assess important systems thinking concepts such as feedback, delays, and stocks and flows. For example, people are shown a picture of a bathtub and a graph showing the rate at which water flows into and drains out of the tub. They are then asked to sketch a graph showing the amount of water in the tub over time. We found that students from elite business schools with essentially no prior exposure to system dynamics concepts did extremely poorly, showing weak understanding of stock and flow concepts. Ron Zaraza will give the results of asking the same questions to high school students who have had exposure to system dynamics. We will discuss implications of these results for important real world issues including global warming. We hope to start a dialogue with the participants at the conference about the implications of these results for systems thinking curricula in the K-12 setting and beyond. We will also make the tasks we used available for participants to use in their own teaching. Two systems courses and their genesis and evolution will be presented: Northwest Rhythms: Understanding a world of change describes the six-year evolution of a systems course from predominantly system dynamics simulation to the use of various systems and writing tools to understand the rhythms and patterns of the Pacific Northwest. Hear a story fraught with troubles and possibilities: politics, gender, technology, storytelling, and moral dilemmas. A new system dynamics course in Ontario: Inspired by a student from DynamiQueST, the author wrote a course in collaboration with the University of Ottawa Economics and Systems Science Departments using a series of historical case studies. Each case study highlighted the application of a particular systems tool or method in understanding an economic, political, environmental, psychological or historical event. Building from an understanding of the systems worldview, students then learn basic computer modeling skills and use a group research project to focus and further develop their skills on a current event of their choice. The author will highlight the challenges faced when trying to integrate a new SD course into a very rigidly controlled curriculum and a school district in transition.